You can spend hundreds or thousands of dollars creating your dream garden, but if you are not using the correct potting soil and fertilizer, those brand new flowers and plants will not receive the minerals and nutrients they need to flourish. There are many different types of potting soils available on the market today, but knowing which ones are the best for the job does not always come easy. Learning what to look for in potting soil is the first step a gardener should take before getting their hands dirty. Why is Potting Soil Important? Potting soil is important for a number of reasons, but ultimately should be used to maximize the growth of plants or flowers. Potting soil will keep some moisture in the ground where it is needed, allowing for a plant to soak in water as necessary. The soil can also retain essential nutrients for plant growth, which means that any fertilizer introduced will not be wasted. An ideal soil will also allow for optimal air flow to ensure that a plant will have room to breathe and grow. The soil will also help to support a plant’s roots. By supporting the roots, a plant is less likely to be unrooted by heavy gusts of wind. This is important to note for new plants with undeveloped roots. What is in Potting Soil? 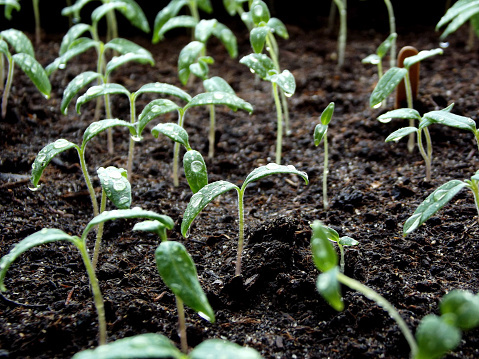 Potting Soil is a man-made mixture of three basic ingredients. Those ingredients typically include peat moss, pine bark, and perlite. Peat moss is an excellent moisture retainer which ensures that the plants are hydrated. Generally the best peat moss for growing will come from either Canada or northern regions of the United States. Pine bark also helps retain some moisture in the soil, however its main purpose is to help with retaining fertilizer and allowing air space. Air space along with fertilizer will ensure that a plant grows correctly, and allows the plant to have some breathing room. The last key ingredient potting soil should contain is Perlite. Perlite comes from volcanic glass cracking during its cooling process. It is used in potting soil to allow for additional air flow throughout the soil. Perlite is the most recognizable ingredient in potting soil due to its white color and irregular bead shape. The most common tip gardeners tend to forget is that the quality of a potting soil is not measured by weight. Potting soil should be somewhat light and not feel water logged. Gardeners should also note that not all potting soils contain fertilizer. In some cases (depending on the soil) fertilizer may need to be mixed into the potting soil. So always be sure to check the bag! Lastly, replacing potting soil periodically can be beneficial to growth, especially if a plant is struggling. Feel free to contact us if you have any questions about potting soils or are interested in our landscape wholesale supply. Also be sure to ask about our lawn care and design packages for both home and business owners! Filed Under: Green Blog Tagged With: garden soil, gardening soil, good soil, importance of potting soil, potting soil, what is in potting soil?